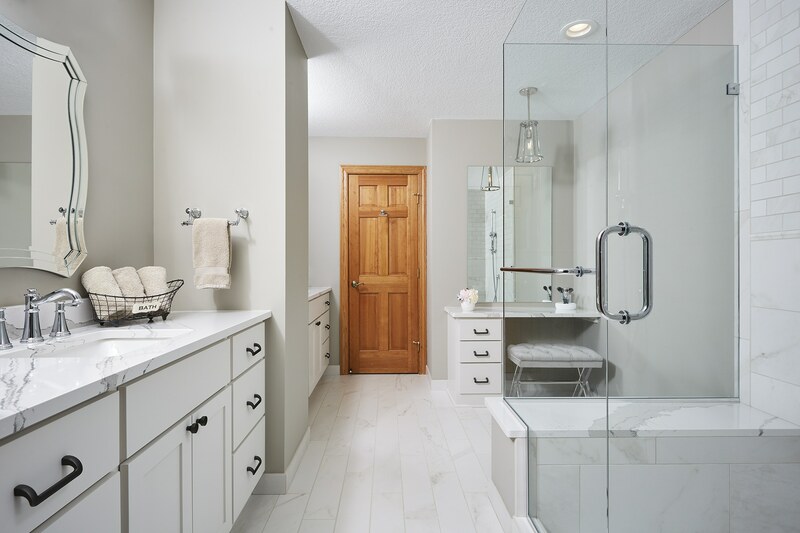 The Fields of Lake St. Croix Bathroom Remodel Challenges: This Master Bathroom had a functional layout, however the original builder grade finishes were not up to par with the homeowners’ style. As is typical of homes built in the early 2000’s, this bathroom had an oversized, unused tub, and a small, cramped shower. The bathroom also felt dark since there was no natural light. These homeowners provided us with a vision book of different looks and designs that they liked. We worked with taking the individual pieces and styles and making them work together, cohesively. High end finishes and soft shades of gray and white were the ultimate goal. The Novare Renovation Bathroom Solution: We removed the undersized shower and replaced it with a larger version with frameless glass. We had the opportunity to use different size tiles set in a 1/2 offset pattern to to add visual interest. The floor allowed us to play with smaller hexagon tiles in the same shades of white and gray. A gorgeous piece of Cambria quartz caps off the bench at the back shower wall. Since the jacuzzi tub was not utilized, we removed it and this gave us space to add a makeup area which is utilized on a daily basis. Cambria’s Brittanica in a glossy finish gives this new area a neutral slate to work at. A large mirror and hanging pendant light finish off the space. The two new vanity cabinets were custom built with flat panel doors and soft close drawers. These were painted in Benjamin Moore’s Classic Gray and finished off with Ash Gray knobs and pulls that complement the modern, minimalist look. The same Cambria Brittanica Quartz tops the vanities as well. Scalloped edge mirrors and cased opal glass lighting brighten and lighten the space. Moen Belfield fixtures in a chrome finish add just a touch of shine to this neutral palette. To address the lack of natural light, we added a window at the far end of the bathroom. The location of this window lets in the sought after southern exposure. This combined with the light color scheme brighten up the space. The worn out flooring was replaced with a rectangular tile set in a 1/3 offset pattern to complement the shower tile. We exceeded these clients expectations by taking their style and creating our custom design in a spa-like master bathroom that will bring them joy in the years to come. Previous PostTime to Remodel? Hire a Professional.